The tires that came on your vehicle have a number of markings. Those you should be aware of are described below. Whenever tires are replaced, they should be replaced with tires of the same size. 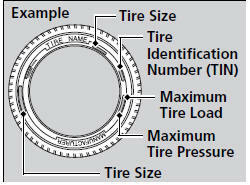 Following is an example of tire size with an explanation of what each component means. P: Vehicle type (P indicates passenger vehicle). 225: Tire width in millimeters. 50: Aspect ratio (the tire’s section height as a percentage of its width). R: Tire construction code (R indicates radial). 17: Rim diameter in inches. 93: Load index (a numerica l code associated with the maximum load the tire can carry). V: Speed symbol (an alphabetical code indicating the maximum speed rating). 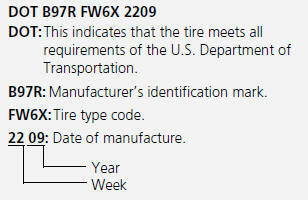 The tire identification number (TIN) is a group of numbers and letters that look like the example in the side column. TIN is located on the sidewall of the tire. Cold Tire Pressure – The tire air pressure when the vehicle has been parked for at least three hours or driven less than 1 mile (1.6 km). Load Rating – Means the maximum load that a tire is rated to carry for a given inflation pressure. Maximum Inflation Pressure – The maximum tire air pressure that the tire Maximum Load Rating – Means the load rating for a tire at the maximum permissible inflation pressure for that tire. Recommended Inflation Pressure – The cold tire inflation pressure recommended by the manufacturer. Treadwear Indicators (TWI) – Means the projections within the principal grooves designed to give a visual indication of the degrees of wear of the tread.